Stella McCartney and Gap... It's here! Stella McCartney and Gap… It’s here! I’m a Gap Kids addict. I know “they’re only clothes, what’s the big deal” (quote from my husband) but they are supremely preppy, well made, stand up to a million washes and still look great…And did I mention style? So when Stella McCartney teamed up with Gap, I was pretty much ready to hop on a plane bound for the US. No need, they’re here (and Babyology readers are first with the news). The Stella McCartney for Gap collection is edgy, fashion-forward and on my highly desirable list. Timeless navy blue combined with vibrant orange sets boys apart and whilst I’m always a fan of wide, rugby stripes it is the gingham jacket with the side zip that has won me. It features a simple, stand-up collar reminiscent of the silhouettes we saw in Prince and Adam Ant film clips in the eighties – that won’t mean much to your ten-year-old but they will know they are wearing something super-cool. Team jackets with jeans that scream ‘now’ – skinny style with a neat ankle zip and available in salmon or navy. I suspect that there will be quite a few mums wishing they were the ones in Stella McCartney salmon pink skinny jeans. 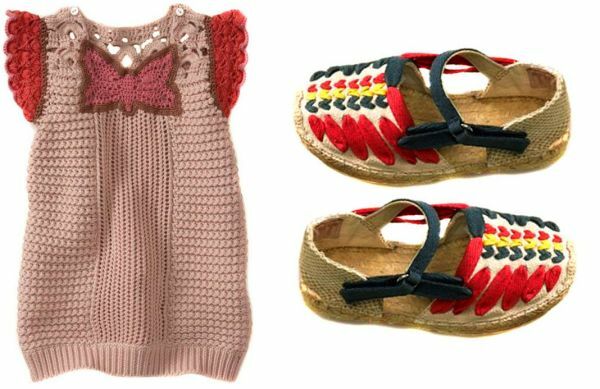 Also available are sweet embroidered espadrilles and a pretty crochet butterfly tunic dress featuring suitably fluttery cap sleeves. Red Nest is the exclusive Australian stockist for Stella McCartney for Gap pieces. The collection is sized from four to size fourteen and prices range from $109 – $135. Have your credit card ready – this range sold out in the US very quickly.